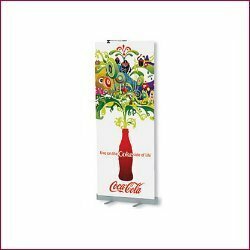 We are Engaged in Supplying of Point of Purchase POP and Indoor and outdoor Advertising Material. Our products are very durable and dimensionally accurate and are widely used by our clients for advertising their products and services. Also, we are well known for offering best packaging options like bubble roll, corrugated and box packaging. Our advertising material finds a variety of applications at places in shopping centers, Shopping Malls, two wheeler and four wheeler dealers, banks, educational institutions, laptop and mobile stores, Departmental Stores and MNCs. The exotic range of advertisement tent or promotional tents are very presentable and best for promotional activities. Our range of Display Tents are ideal for creating brand awareness and advertising. Made from light weight, quality fabric these tents can be easily installed on the site. These promotional display tents are made keeping in mind the minimum set-up time and maximum product exposure. These Promotable Tents can be customized as per our precious customers specifications. Our Promotional Tents are available in different sizes as per the requirement and specifications of the clients. Our tents are resistant heavy weather Offered in economical price range, these have strong frame which is why these are strong in structure. These tents are extensively used in all the seasons and are best suitable for promotional activities. These tents are best suitable for any campaign wherein the the name of the company gets best eye catching appeal. 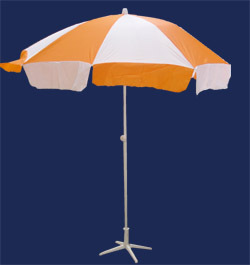 We manufacture a range of promotional garden umbrella for our clients. These promotional garden umbrella can be custom manufactured according to the client's needs. 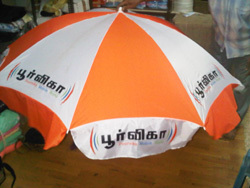 Our advertisement umbrellas are largely used for promotional purposes and can easily fit in two to three people. Apart from this, they are used at social gatherings, tournaments, restaurants, hotels etc. These are customized in variety of colors as per the client's specification and have the company's name and logo printed on them. Easy to assemble, these umbrella stands are made from rust and chip resistant material. We also offer customized manufacturing options at competitive prices. banners are one of the most common and effective form of outdoor advertising. These stands are readily available in size 6ft x 3ft. These banner standees are manufactured as per the international standards and norms using high-grade raw material and sophisticated machines. moreover, our offered banner standees are tested on various parameters so as to ensure their durability, superior finish, accurate dimensions and strong construction. These stands are used for displaying banners which are crucial part of any outdoor advertising campaign.Our customers can avail from us an excellent quality range of Roll Up Stands. We offer Roll up Standees which are perfect for advertising & marketing. It can be used in a compact space and make an effective statement for your company, product. We are direct sellers, and so can give you the best product quality and price.